Graffiti in Sackville is no laughing matter. Unwanted spray paint has been a constant source of annoyance for property owners as well as the public domain. Why bother dealing with an eyesore when having it removed is as easy as making a phone call? Our Sackville graffiti removal gets rid of paint without any additional stress, headaches or damage. Graffiti can rear its head up just about anywhere. Aerosol sprays are easy to transport and light to carry. This means that just about nowhere is safe from an impromptu paint job. No matter how hard you try to prevent graffiti from hitting your property, there is no way to keep it off completely. When the time comes for your removal, who better than a Gorilla to help you ditch that paint? Our Cochrane graffiti removal specialists are fully equipped to scrub paint from homes, multi-unit properties and businesses. Wherever you find graffiti, you can find a Gorilla! The best way to get proper results for your Sackville graffiti removal is to know what you are dealing with. Since graffiti is a popular tool in hardware and department stores, there are tons of types to deal with. Some of these are water soluble while others grind themselves into the dips and grooves of construction materials. Over time, sitting graffiti can bake further into the facade of exterior walls, making removal even harder. 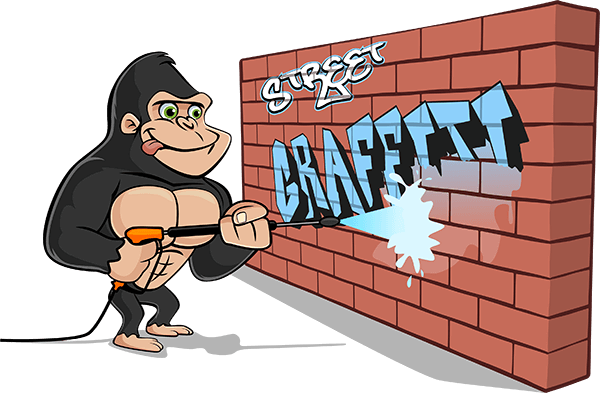 Instead of dealing with problems areas of graffiti, let a Gorilla handle it for you with our Sackville graffiti removal. Our Gorillas arrive on scene, sectioning off affected areas to prevent stains from bleeding onto other areas. Once the area is secure, a treatment of Gorilla Foam cleanser is applied to loosen surface stains. Once easy to remove pieces are out of the way, our Gorillas treat the cause of staining and get your property looking great once again. Our particular brand of graffiti removal covers property owners for the present and the future. A treatment of our anti-graffiti coating creates a barrier between materials and paint stains, making removal easier later on.